Broussard entered Judge Thomas Reardon’s courtroom at 11:39 a.m. wearing shackles and a red jail jumpsuit. He passed in front of the defense table where Bey IV and co-defendant Antoine Mackey sat staring at him intently; he didn’t meet their eyes. Bey IV wore a tan suit and a bow tie — the symbol of the Black Muslim movement that Broussard said he himself joined in 2006. Within minutes, Broussard was asking for questions to be repeated, and seemed to find it difficult to formulate answers. Bey IV court-appointed lawyer, Gene Peretti, made numerous objections in the first few minutes. Reardon frequently jumped in, trying to clarify and simplify Krum’s questions about how Broussard came to join the bakery. Broussard said Richard Lewis, a close family friend who was in a San Francisco jail with him, had also spent time with Bey IV when Bey IV was awaiting bail in a vehicular assault case. Broussard was due to be discharged the next day and Lewis asked him his plans. 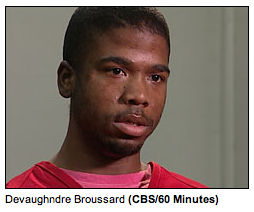 “Probably going back and hanging out in the streets,” Broussard said he replied. Lewis, though, offered Broussard an alternative: joining the ranks of so-called soldiers working for Bey IV at his bakery in Oakland. Lewis said Bey IV needed “people he could depend on,” Broussard told a jury of seven women and five men. The attorney who negotiated Broussard’s plea bargain two years ago, LeRue Grim, watched from the front row. Grim said Broussard told his family to stay away from court on Thursday because he feared for their safety. “He thought they might be in danger,” Grim said of Broussard’s stepfather and half sister, who had wanted to attend. Speaking in the courthouse lobby during Thursday’s lunch recess, Peretti said he had no idea why Broussard would believe his family would have anything to fear. “He is a liar, that’s my opinion — he is an admitted liar,” Peretti added. The lawyer said his client, Bey IV, is “more than disappointed, he’s outraged” at Broussard’s plea deal and testimony. He also said Bey IV “never wanted to be CEO of the bakery.” He reluctantly took the job following his elder brother’s murder and lacked the business experience and maturity to make it work, Peretti said. Earlier Thursday morning, jurors flinched — and some looked away — when shown an autopsy photo of Bailey’s face, blasted away by pellets from a 12-gauge shotgun. Krum displayed the photo on a large screen as the forensic pathologist who performed Bailey’s autopsy, Dr. Thomas Rogers, described the wound. One juror, a bald man in glasses, grimaced noticeably. The photo showed what Rogers described as an eight-inch wound of his “face bones, brain, skull, teeth.” Bey IV and Mackey glanced at it and then looked away. Krum asked Rogers the condition of Bailey’s left eye. “It was basically destroyed,” Rogers replied.